grandma's cookie jar: Don't Forget - Cherry Republic Give-Away Tomorrow! Don't Forget - Cherry Republic Give-Away Tomorrow! 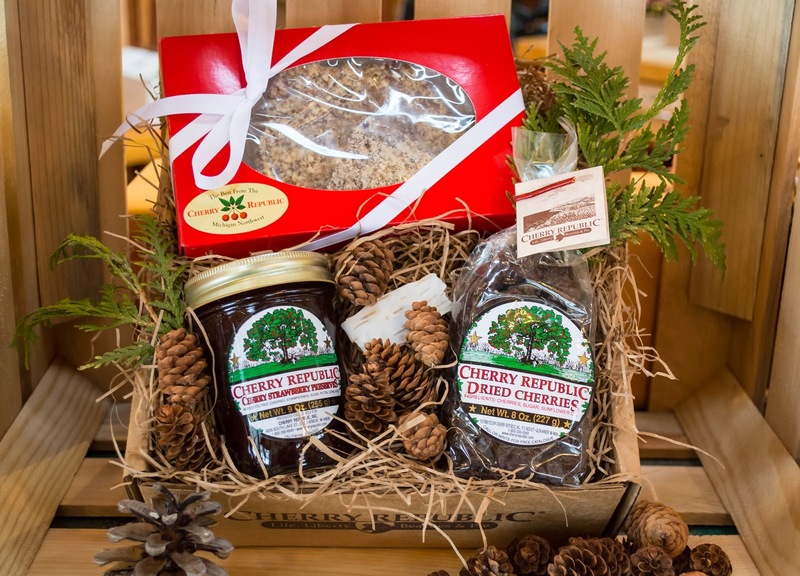 Yes, tomorrow, February 15, 2014, I'm giving away a tasty gift package from Cherry Republic! You'll find all the specifics at this link, but today I thought it would be fun to share a few more "cherry fun facts" with you! Did you know . . .
To really bring out the flavor of cherries, use ¼ teaspoon of pure almond extract. A chemical reaction between cherries and alkalies such as baking powder causes a blue discoloration in a baked product which can be prevented by using sour cream instead of milk in the recipe or by adding an acidic liquid. Red cherries contain melatonin which helps to fight against harmful toxins. They also contain a high level of antioxidants which are beneficial to the human body, are low in cholesterol, fat, sodium and 1 cup of cherries, with pits (approximately 117.0 g), contains only 74 calories. They are also a very good source of fiber and Vitamin C.
Tart cherries are known to contain certain chemicals which are very effective in relieving pain even better than medicines like aspirin and ibuprofen and are known to provide pain relief for people who suffer from arthritis. Cyanidin in cherries has anti-inflammatory properties. This helps in the treatment of gout as it helps to reduce the swelling and pain. Cherries also contain the highest amount of natural Melatonin which is known to regulate the rhythmic patterns of the body. Michigan has around 35,000 acres of tart cherry trees; they grow almost 75% of the tart cherries which are produced in the United States. Traverse City, MI, is therefore called the Cherry Capital of the World. Depending on the conditions of the growth, about 7,000 cherries grow on an average tart cherry tree. A cherry pie is made using approximately 250 cherries. Therefore to make 28 pies, an entire tree's cherries would provide enough cherries. 150 to 200 pounds of tart cherries are produced annually in Michigan which has almost 4 million cherry trees. Which "fun fact" do you find to be the most interesting? I thought the one about cherries containing natural Melatonin was interesting as well as how many cherries it takes to make a pie!